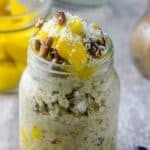 Coconut mango overnight oatmeal – Start your day on a healthy note with this gluten free coconut mango overnight oats with a hint of cardamom spice. 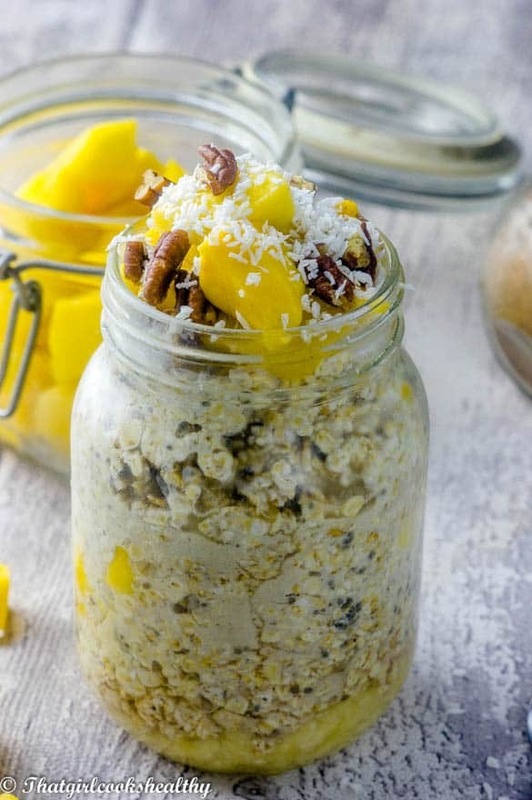 Have you noticed that overnight oats seem to be in vogue right now? 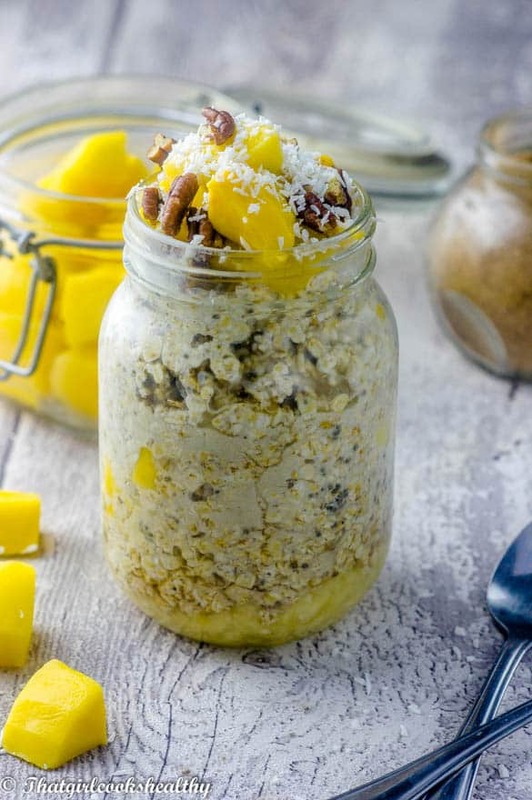 Just have a browse through the internet and type in overnight oats and you will be met with a plethora of variations. I have to admit that I have hopped right on the bandwagon with this trend. 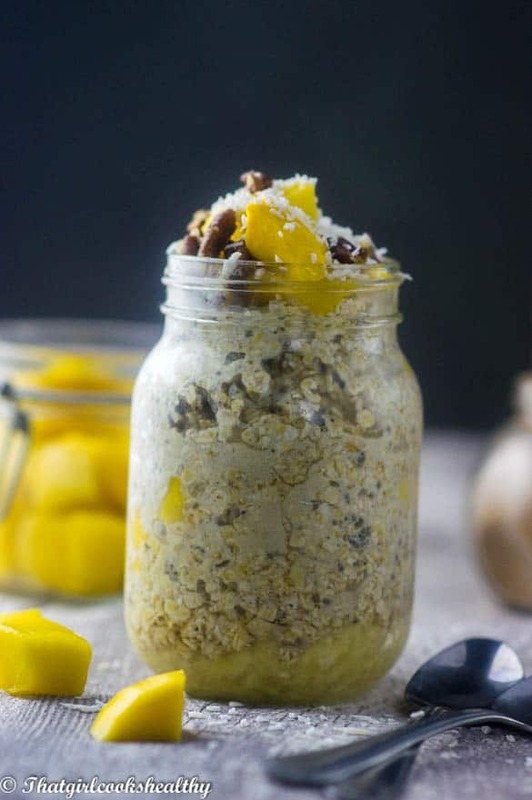 For one I am a huge fan of oatmeal in general, be it overnight or served on the same day – I’m not really partial to either BUT……….I can certainly see why the overnight oats seem to be gaining so much popularity. The main reason why this type of oatmeal is trendy is because it is convenient and has a wide range of diversity. Consider this, the vast majority of the nation skip breakfast on a daily basis – for some people they simply don’t have the time in the mornings, be it because they are rushing off to their 9 to 5 job or a busy mom doing the “school run” as we call it in the UK. Either way, both examples which I have given provide a little insight into why lifestyle can impact the consumption of breakfast. Add overnight oatmeal to the mix and there is potentially a solution to a pressing issue (breakfast omission). The biggest advantage here is the ability to prep breakfast the day before with minimal effort. Add all of the ingredients listed into a mason jar, leave in the refrigerator overnight and eat the very next day. You can even pack the jar in your bag and bring it with you to work or on your travels – how cool is that? Breakfast on the go! Where do I sign up. This recipe is brimming with a nice tropical flare – coconut and mango with a hint of my favourite spice, cardamom. Mix a large banana into the oatmeal for some subtle sweetness as well as some agave nectar if you wish. I used almond milk as opposed to coconut milk just to diversify the oatmeal but if you want your oatmeal more coconutty then use coconut milk instead. Mix together the gluten free oats, almond milk, chia seeds, cardamom powder. some of the mango pieced and 1/4 cup worth of the shredded coconut in a bowl. Meanwhile add the crushed banana to the bottom of a mason jar then top with the gluten free oatmeal mix. Reseal the mason jar and refrigerate overnight. Have the remain ingredients in a bowl ready for the morning. 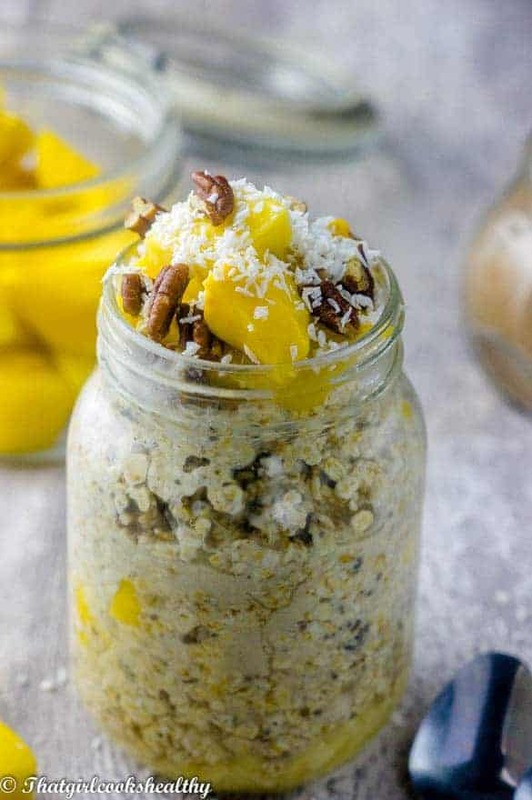 In the morning remove the lid from the jar add for almond milk if needed to loosen things up a little then top the oatmeal with the rest of the mango chunks, shredded coconut, flaxseed, agave nectar and walnuts.